Voices resonating with joy come to me from above. Skiing down to me through the trees, those voices are full of energy and excitement. At the age of nine and seven, my grandchildren, Quinn and Sara, find themselves in nature. I am full of joy and energy to experience skiing downhill through the trees. Ever since I learned to ski at age four, I stuck to the groomed runs. Any given day, I will ski a couple expert runs, a couple beginner runs and mostly intermediate ones that I have skied hundreds of times. Now, 60 years after I learned to ski, I am learning to explore the boundaries and the unexpected obstacles of the cleared trails. Sara, Quinn and I recall the fun and experience of tree skiing when we stop for lunch at the lodge. And, yes, as they came from above through the trees, I did video them on my smart phone and will upload that to social media later. Have you stayed out of the trees all your life? Do you prefer to go down the same runs repeatedly in your career? What if you committed to take three new trails every day you ski? Are you isolated, stuck, separate from others and nature? When was the last time you really evaluated your boundaries, and explored your possibilities? What is the story of you? What might you be? As we reflect on our future, legacy, learning, organizations and nature, we see the interweaving of all these elements into one tree of life. These elements are not separate. In our childhood, we play in and learn from nature. As we move into our career peaks, we yearn for connection. Leadership is, too often, a lonely place. Then, as we enter the last quarter of our lives, we again play and learn from nature. We realize that we are not separate from one another or the environment we exist in. We are that nature. 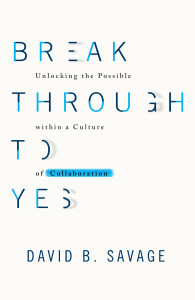 I offer you the prologue to my 2016 book, Break Through To Yes; Unlocking the Possible within a Culture of Collaboration published by Elevate Publishing. A forest is our culture. How we collaborate is our legacy. Forest in the Adirondacks of New York State. David B Savage photo. We stand together in this natural space. We are up to 150 years old. But we are young. We have tiny wild flowers and moss at our feet. We have a wetland as our close neighbor. We have deer, elk, bear, moose, cougar, ants, worms, gray jays, osprey, bald eagles, loons, bats, painted turtles, squirrels, caterpillars and lichen. We are alive. We are healthy. We are green. The air is fresh. We are Tamarack, Ponderosa Pine, Fir and Birch. With our neighbors, we are an ecosystem. We are together a forest. Far down below our crowns, we notice a man with a chain saw. He brings pain, anguish, death…some of our family fall, are cut up and hauled away in trucks. As rough roads are cleared more trucks come with earthmovers, more men and more chain saws. Our rich, green, mossy forest bed is scraped away by noisy, smelly machines. Rock and crushed gravel begin burying our nutrient- rich soils. An ugly, rectangular, grey tin mobile home is trucked in and set down where members of our family once stood so proud, so green and so in community. That large grey tin box is set so the humans can sit inside to view our wetlands. Our roots and ecosystem are destroyed to make room for the humans, their house and road. The wetlands now, too, are being poisoned by the pollutants seeping from this devastated site. Powerful 80-mile-per-hour winds blow tonight from the south. Together a forest stands to protect our ecosystem. We know this and usually withstand the wind with ease. Yet, we have lost some of our strength. There are missing trees in our forest. The loss of those that have been cut down have lessened our ability to withstand the strong wind. We bend. When we bend in the wind, we bend too far into those blank spaces. Our trunks are cracking. A few of us crack open and splinter. A number of us fall. This is a night of fear like none of us have ever seen before. We tighten in our fear. We grieve for those in our family members that have cracked, broken and fallen. So much damage suffered by us and by those that caused this. In the morning, humans burst forth in anguish and anger. . . and more chain saws and more earth moving. What was once our forest is now reduced to fewer than half the trees and ecosystem of a few short months ago. Can’t these humans see what they are causing? Why do they not look up to us? Instead they look only at the damage to what they see as their own property. Powerful fall winds blow yet again in the valley below the majestic peaks of the Rocky Mountains. In mere weeks, we are no longer together as a forest. We Tamarack, Ponderosa, Fir and Birch are now stressed, separated and at risk. More of us fall tonight. For many, our community of 150 years is now reduced from prosperity to a horrifying survival mode. The trucks return and get stuck in the gravel and mud that, a short time ago, was lush undergrowth. And, now, more trucks dumping gravel across the barren acreage that was once our forest. The wetland is in pain. The new high fence around the perimeter of this lot now interferes with the deer, bear, cougar and other wildlife that used to live and pass through this land. The humans purchased this land for the beauty and natural environment here. Through their self-centered focus, ignorance and disrespect, we are no longer holding together as a forest. We trees did not fight back. What could we do when our root systems and entire ecosystem we helped support were so tragically and selfishly damaged. Many trees simply fell. We are now a gravel pit, with a trailer, trucks, fence and a very few Tamarack, Ponderosa Pine, Fir and Birch We hope that over the next 150 years, we will recover this ecosystem, but few of us believe it. This ecosystem is our collaboration. In the wind, we hear more chain saws repeating their devastating mistake down the road. We wish these humans could bring us into their consciousness. We wish the wildlife had a presence here as well. Where are the humans that could have informed these men? Where is the collective wisdom? Why must we be isolated and then damaged. We dream of change. This is a true story. This tragedy took place near my family cabin in the Rocky Mountains of British Columbia, Canada. Trees collaborate in nature, but have no knowledge of collaboration in the face of human destruction. Humans collaborate and can learn together to change what seems to be tragic, inevitable consequences. My wife, Lise, has been a professional forester and Supervisor for Compliance and Enforcement for the British Columbia Ministry of Forests, Lands and Natural Resource Operations. One of her many responsibilities has been to hold companies and individuals accountable when they damage the environment out of either ignorance or intent. Several years ago, she had charged a logging company with illegal tree harvesting beyond the boundaries of their permit area. The company management fought back. Her response included, “I am charging you for the value of a number of trees that have been destroyed. We assess the value of the timber in these matters. But what is the value of a tree in a forest? That is far greater than looking at a tree as a lone entity. Shall we go there?” The company paid the fine and started to look at ecosystems in a more holistic way. They started to realize the gains they may create by practicing a much more sustainable and collaborative culture in their organization. Like trees, we are a forest together. In this forest, this earth sustains and challenges us. The actions, judgments and projects of others affect people and forests around the globe. How we collaborate determines the quality of our lives and the quality of our lives determines the ecosystem of human relationship on this small blue planet. By learning better collaboration skills and practices, we may become a more sustainable species. My intention is for the reader to become far better at communicating, engaging, creating, developing trust and holding accountability with others in their organization, community and family—and within themselves. Too often, teamwork and direction consists more of manipulation and one-dimensional directives than collaboration and leadership. Our forests turn to barren land after the winds blow us down one by one. We must come together and learn how to lead from a collective perspective. One that honors the quality of life for ourselves, our families, our organizations and our global relationships. Together, we must learn to dream of a healthy economy, environment and community. The family that was responsible for cutting down the trees near our cabin simply wanted to build their own beautiful home. But they gave little thought to the community they were destroying and how that would come back on them. Conversely, poorly or inconsistently executed collaborations can also damage the community/organization. Each act, each project, each team and each organization must plan, execute and celebrate how they work together as a continuum. We are all in this together. We are a forest. My grandchildren, Quinn and Sara, love being in the forest. As they grow to adulthood and become leaders, I hope they will not find themselves feeling separate, isolated or disconnected. Their futures are part of the ecosystem that today, you and I are nurturing. What is the culture of your family, community, organisation, nation and planet? If you feel the energy and gift in nature, how will you mentor the young people in your world? How will you be the soil for your network? In what ways, may you allow the light to shine for others? Are you building a culture of collaboration? What do you choose right now? Here’s to you and our shared future. 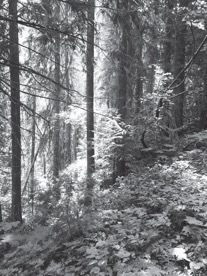 In this article, I have included two of my own photographs of beautiful forests in British Columbia and New York State. When you activate your own answer to Question 7, leave the grey for others, make your forest diverse and brilliant. Now, let’s work together better! Secret insight: look at the cover of Break Through to Yes again (above). Do you see four letters with shadows? EGOS. And our egos are what keep us separate and less than our potential.